Acetal (Polyoxymethylene), with its high stability, high resistance to wear and tear and exceptional strength makes it the ideal material for precision components. Homopolymer Acetal (POM) shows good sliding properties and high resistance to wear and tear because of the high strength and smooth surface. There is a very low risk of stress cracks occurring with this material and is therefore suitable for applications requiring exceptional rigidity and strength. Copolymer Acetal (POM-C) is semi-crystalline in structure and exhibits a higher thermal stability and high resistance to hydrolysis over traditional Homopolymer Acetal; ideal for high-moisture environments. 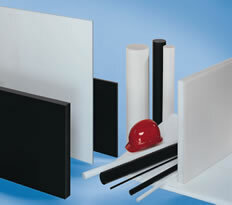 Macplas LTD is able to supply a range of Acetal solutions in rod, sheet and tube form. • Variant of POM (Copolymere) with an improved electrical conductivity. Surface resistivity ≤ 1011 Ù. • Variant of POM (Copolymere) with improved sliding properties for applications with an increased abrasion.